GEOS on the C64 was something I'd been meaning to look into using ever since I received my Ultimate 1541-II last year, so with my main desktop PC still out of action I decided to finally give it a go. 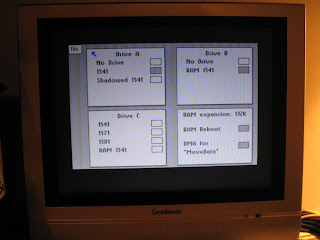 GEOS (Graphic Environment Operating System) was released back in the late 1980's for the Commodore 64 and 128 machines and provided it's users with a rather impressive GUI similar in appearance to early Mac OS. 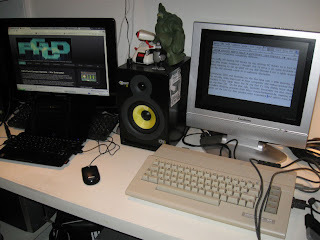 Capable of running on a 64KB, 1Mhz 8-Bit machine and complete with a comprehensive suite of applications (including an art package, word processor, spreadsheet and even a desktop publisher) GEOS is a technical marvel and further testiment to the old adage "if there's one thing a C64 can't do, it's nothing". Getting it up and running on the U1541-II was a little bit of a faff, but now I have my boot disk configured I can see myself putting the machine to good use. There's something particularly special about being able to type a article (like this one) on an ancient piece of hardware and yet still have the ability to transfer it to my PC and post online in a matter of minutes. As well as being able to export documents from GeoWrite (the GEOS word processor) to a PC and import UTF-8 formatted text, one of the features that most impressed me about GEOS is the ability to reload the status of the system and continue your work via clever use of the REU (RAM Expansion Unit). You can be work on a document, take a break and play a couple of games or demos, then pick up where you left off by executing the LOAD"RBOOT",8 command from Basic - as long as the C64 hasn't been turned off or REU overwritten. This is both surprising and very much ahead of it's time, considering the fact that we are talking about an 8-Bit OS developed before Microsoft Windows 3.1. Anyway, I appreciate that this is more than a slight deviation from the usual content of this blog, but if anyone out there has an Ultimate 1541-II and wants to give GEOS a go, I've written some very simple guidelines to get you started. In the U1541II setup, under 'C64 and Cartridge Settings' ensure that the RAM Expansion Unit is enabled, and that the size is set at 16MB (although GEOS 2.0 will only see 512KB). Download the GEOS boot disks from here. Create a couple of blank .D64 images, and rename them COPY2REU.D64 and WORKDISK.D64. Transfer all the disk images over to your U1541II. and press enter. It'll take a while, but eventually GEOS will pop up. Now the next step is to run the CONFIGURE application, so double click on that (using the joystick to control the cursor in port 1). From the File menu, save these settings and quit back to desktop. (3). Back on the GEOS desktop, select the DESK TOP icon and copy it to the RAM 1541 (B) disk. You might also want to grab a few other useful programs, such as PREFERENCE MGR and PAD COLOR MGR and copy them over too. (4). Mount the APPS64.D64 in drive A. Copy over GEOWRITE, NOTE PAD and anything else you want to use regularly to the RAM 1541 (B) drive. (5). Mount the COPY2REU.D64. From the disk menu at the top of the screen, select format. When complete, copy over the contents of the RAM 1541 (B) drive to this disk image. The point of this disk is so that you can copy over the contents to your REU after first loading GEOS to reduce disk swapping and increase speed. Best practice is to run everything from the REU and save your work regularly back to floppy disk/D64. (6). Mount the WORKDISK.D64, and just copy DESK TOP over to it from the RAM 1541 (B) drive. This will be where you will save any work or documents, but it is always good to have a copy of DESK TOP on there. Whenever you want to load GEOS, just mount the GEOS64.D64 and execute LOAD"*",8,1 from Basic. When the desktop appears, mount your COPY2REU.D64 and copy over the contents to the preconfigured RAM disk (B). Note that if you reset the machine (or execute a standard C64 game or demo) and want to return to GEOS, just re-mount GEOS64.D64 and execute LOAD"RBOOT",8,1 instead - this will load the OS from the REU much faster. Note that this will only work if the C64 hasn't been turned off or the REU overwritten. You are now up and running. Have fun. This is a very simple process, as long as you have a method of transferring a *.D64 image containing your GeoWrite documents to your PC. (1). Compile your GeoWrite documents onto a single disk image. Transfer the *.D64 to your PC. (2). Open D64Lister (http://www.hardworks.de). Drag and drop the *.D64 file into the open window. The directory listing should be displayed. Press the GEOS icon from the menu bar. (3). You should now see a list of familiar looking icons. Double click on the document you want to convert and it should open in a viewer. By right-clicking, you can now 'save as' a formatted *.RTF file. Before continuing, I have to stress that this is not a perfect method. Unlike the incredibly simple process of transferring/converting GeoWrite files over to a PC as formatted *.RTF, actually importing text files into GEOS is a lot more difficult. (1). Create a text file on the PC, and save in UTF-8 format. The transfer process reverses caps/lower case for some reason, so it is probably best to save your document entirely in uppercase (or type it normally and then use the 'Toggle Case' command in Word or similar word processor). (2). Open up DirMaster (http://style64.org/dirmaster) and create a new *.D64 image. Drag and drop your text file into the open image (a SEQ file should be created). Save the disk image. (3). Transfer this *.D64 file onto your Commodore 64. Load up GEOS. (4). Mount your *.D64 image containing the SEQ file you created. When asked whether or not to convert the disk to GEOS format, click on YES. Copy the SEQ file from the disk to either the REU or your work disk (ideally together with GeoWrite, Text Grabber and the Generic II Form (these can be found on the Write Utilities disk). (5). Run Text Grabber. When prompted, select Generic II as the Word Processor type, then open up the SEQ file. Enter a suitable name for the output GeoWrite document. You will have the option to (briefly) view the contents of the file. When the conversion is complete, exit Text Grabber. (6). Finally, open the newly created GeoWrite document and continue with your work. Good info, and works well! Please note that you can use both WinVICE and the 1541 U-II are capable of saving the REU memory, which could help save even more time.